Coming off a two-week break, the Boys in Blue take to the road to face Swope Park Rangers on Monday, April 15 at 8:00 p.m. The meeting between the sides is the first of two matchups in the 2019 USL Championship season, with the return trip to Lucas Oil Stadium on October 19 set to close both squads’ regular season campaigns. 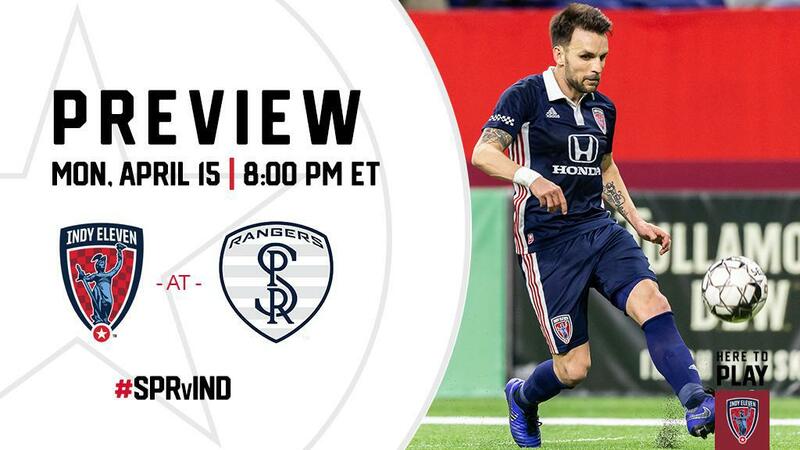 Indy Eleven (2W-1L-0D) travel to Kansas City (Kansas, for the record) after back-to-back byes in Week 5 and Week 6, with #SPRvIND technically kicking off Week 7 action. The Boys in Blue defeated Hartford Athletic 1-0 in their most recent match all the way back on March 30. Forwards Dane Kelly and Thomas Enevoldsen nearly netted the opening goal on multiple occasions, but an own goal in the 40th minute from Hartford’s Nikolaj Lyngø ultimately handed Indiana’s Team three points on the evening. Goalkeeper Evan Newton recorded his first clean sheet of the season after strong defensive performances from Alex Crognale, Paddy Barret and Neveal Hackshaw allowed only two on-frame shots. Defender Ayoze Garcia earned a spot in USL Championship’s Team of the Week for Week 4 after a standout performance in his season debut against Hartford. Swope Park Rangers (0W-2L-1D) enter Week 7 after surrendering a 3-1 lead at home to Bethlehem Steel FC in the final 17 minutes of the match last Saturday. An own goal by Rangers’ Mark Segbers saw the sides draw level before a 93rd minute match winner found its way into the back of Swope’s goal, resulting in a shock 3-4 defeat. Those four goals allowed brought Swope Park’s concessions on the season to nine, tied for the second most in the Eastern Conference heading into weekend play. The Kansas City side is on the better half of the scoring chart, netting six times in the first three games of the season. Jerome Ngom Mbekeli leads Swope in scoring having found the back of the net twice in three appearances. Despite netting often, the side is still figuring out the back third as they chase a first clean sheet of 2019. A different ‘keeper has appeared in each of the last three fixtures, but none have been able to keep their net empty through 90 minutes. Indy forwards Kelly and Enevoldsen will aim to harass Swope Park’s backline throughout the fixture as the pair looks to raise their respective goal scoring tallies. It will be up to Newton to command his backline as he aims to collect his second clean sheet of the season against a strong Swope front third. Ayoze made his first start and appearance of the 2019 season in the club’s home opener against Hartford Athletic. The 33-year-old, now in his 17th year as a professional, recorded a full 90 minutes against Hartford and displayed class up and down the left sideline that earned him a Team of the Week nod. The Spaniard created four chances throughout the game, one of which led to the own goal that handed the Boys in Blue the 1-0 victory. Ayoze’s inventive play down the left flank reminded fans why the winger was named to the 2018 All-League Second Team in his first season with Indiana’s Team. Against a defense that has been porous early on, expect to find the native of Puerto de la Cruz, Spain creating havoc down the Swope Park flanks come Monday night. Two players of Swope Park Rangers’ 24-man squad have started and played every minute of the first three games – midfielder Jerome Ngom Mbekeli is one of them. The native of Cameroon made his presence felt by notching a brace in Swope’s and Mbekeli’s third match. The two goals scored against Bethlehem Steel were the first two of the season for the 20-year-old midfielder – and quickly landed him at the top of the Swope Park goal scoring chart. Despite his goal scoring ability, the MFK Vyskov loanee has struggled to move the ball; on average, he’s completed just over half of this passes while adjusting to life in Kansas City (which, when you’re coming from the Czech third division, we imagine takes more time than usual). One of the highlights of Indy Eleven’s offseason moves was the number of skilled forwards Coach Rennie brought into his squad. The additions of Kelly, Enevoldsen, Ilija Illic, and youngsters Alioune Diakhate and Josh Penn added dangerous firepower to Indy’s final third. On Monday night, that group of forwards will have the chance to display their explosiveness against a struggling Swope Park Rangers defense. Rangers’ trio of rotating keepers have faced a combined 49 shots, 27 of which have been on target. The Kansas City side has also fielded a different backline in the first three matches of the 2019 season, in addition to fielding a different goalkeeper. The constant turnover in Swope’s defensive positions has led to 39 shots allowed inside the team’s 18-yard box in three matches, a statistic Indy forwards will surely salivate over as each of the five Boys in Blue goals scored in 2019 have come from inside the opposition’s penalty area. Swope has also struggled defending set pieces, allowing three goals from dead ball scenarios. Odds of a goal from a set piece bode well for Indiana’s Team, who have converted two goals from corner kicks in three games. Just because you're not traveling with the team doesn't mean you should miss any of the action. All USL Championship 2019 regular season matches are available at your fingertips on ESPN+. New users can click here to start a free seven-day free trial.